What Is the Crotona Midnight Run? 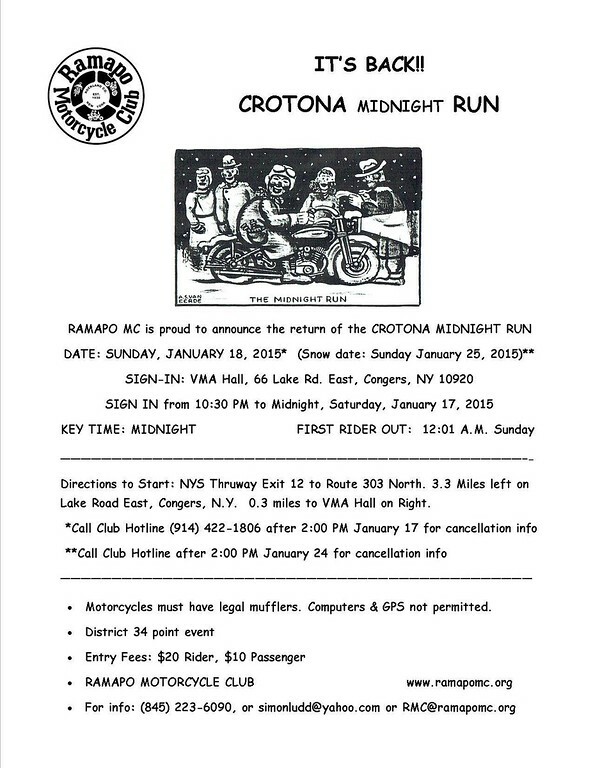 The Crotona is a timed road ride in which participants must sustain moving at 30mph over a course of 120 miles without the aid of GPS. Sounds easy enough, right? But the cold of winter and the dark of night keeps riders on their toes. The full course is divided into two 60 mile legs, with a 2 hour layover at the halfway mark. The ride starts at midnight, with riders being released 1 every minute. Throughout the course are random checkpoints, logging your arrival time. You start the ride with a bank of 1,000 points. Points are then deducted from your score (or not) based on what time you arrive at the checkpoints along the route. You must make all checkpoints or you will be a DNF. With a new starting location and an earlier than I can remember start date in January, let’s hope that the gang at Ramapo Motorcycle Club have better luck with the weather. The past few years have seen the event cancelled due to questionable conditions. I’ll be there. My choice of ride will be either my 1964 Honda 305 Scrambler or my 1968 BMW R80/2. I’ve missed the MNR maybe 4 times since 1975. I’ve won High Point 5 or 6 times, and lost count of how many First in Class finishes over the years. Oh, and 2 DNF’s. Back in the 70’s and 80’s, it was held regardless of the weather, including sleet and snowstorms. I fell down 7 times one night… on my 1977 Yamaha IT175! Oh damn, I really want to try one of those. Me too. I keep wondering what the hype is about. It must be something for people to line up around the dang corner to get one. But… something tells me it’s not going to change my life. I’ll wait until they show up at the Stop n Shop.